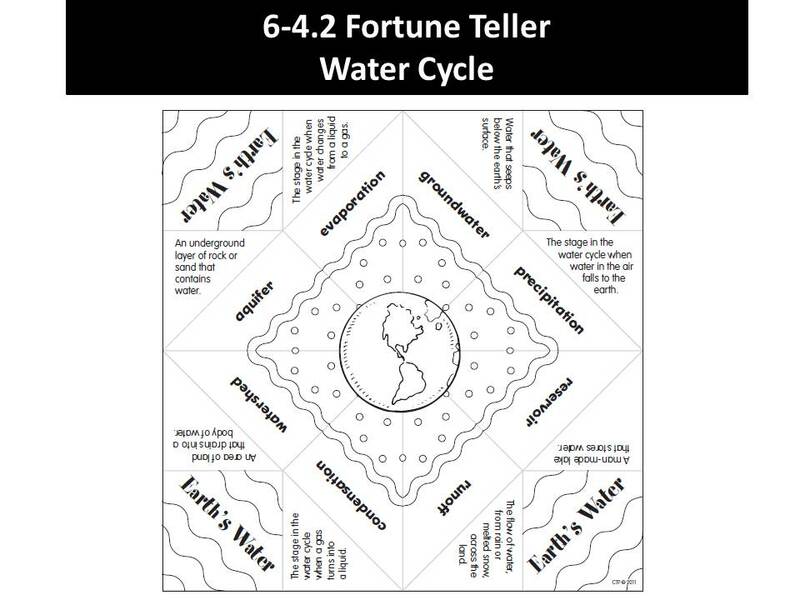 6.E.2A.3 Construct explanations of the processes involved in the cycling of water through Earth’s systems (including transpiration, evaporation, condensation and crystallization, precipitation, and downhill flow of water on land). • After condensation occurs (forming clouds), water droplets fall in various forms of precipitation – rain, snow, freezing rain, sleet, or hail, depending upon weather conditions. • Temperature variations within clouds and/or within the region between the cloud and Earth allows for the various forms of precipitation. • Gravity is the driving force for precipitation. • Water enters the atmosphere as water vapor through the processes of evaporation and transpiration (i.e. plants releasing water vapor). • Thermal energy from the sun causes water to evaporate and/or transpire. • As water vapor rises in the atmosphere it can turn into water droplets or ice crystals which results in cloud formation. • Condensation of water vapor into water droplets or ice crystals must occur on a surface. o In the atmosphere, dust particles (or any other particulates) serve as a surface for water to condense on. o Frost forms when water vapor changes from gas directly to ice crystals on a surface when the temperature at which condensing would take place are at the freezing point or below. • Increases in thermal temperature causes water vapor to rise (evaporation) while a decrease in thermal temperature triggers condensation (clouds, dew, and frost). • If precipitation falls on land surfaces, it always attempts to move back toward sea level as surface-water flow or groundwater flow. • The surface that receives the precipitation determines its flow back towards sea level. o Water will remain on the surface when the surface is not porous or the precipitation is falling too fast for the water to sink into the ground. o Water will sink into the ground when the surface is porous and there is space in the soil to hold the water. • Gravity is the driving force for downhill flow of water on land. • The amount of water on Earth has not changed over Earth’s history. Therefore, pollution can effect this cycle and the organisms that rely on it. • There are human and natural factors that affect the quality of the water in the water cycle. Students can explore the positive and negative effects that these factors have on organisms that rely on water. These factors can include pollution added to waterways by accidental spills or run-off (from roads and cities).